How exciting! I entered the Andalusian Tile Quilt in the Bloggers’ Quilt Festival which is very kindly hosted by Amy of Amy’s Creative Side blog. 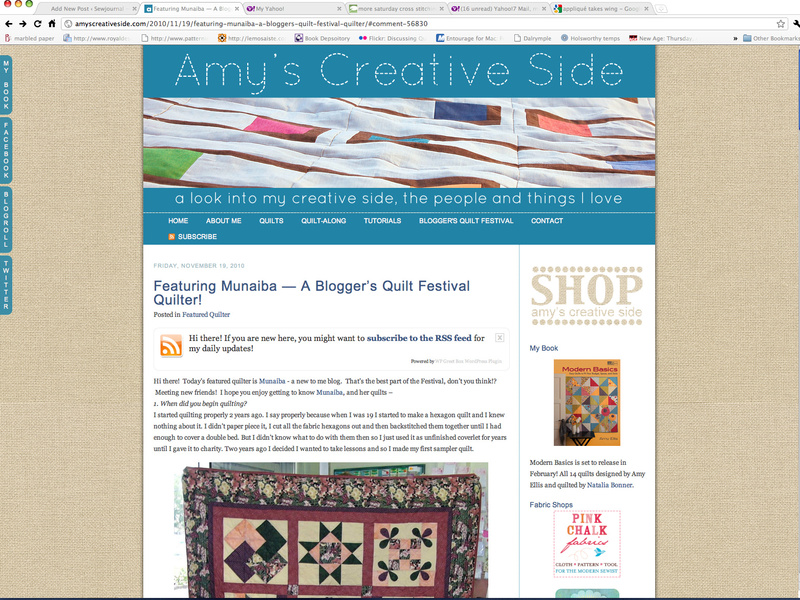 A friend (thanks Sylvia) nominated my quilt to be featured and Amy interviewed me the other day. If you’d like to read the interview you can find it here. Thanks Amy. So what are you up to this weekend? I’m hoping to get some quilting done but the weather is so beautiful and the birds are singing and the sewing machine doesn’t look that attractive. I have to say that I still prefer hand sewing. With hand sewing it’s a journey and I enjoy each bit of it whereas with the machine it’s definitely all about the destination and getting there isn’t that much fun. What do you think? Love the quilt! So cheerful & happy. I’m with you on the hand sewing. Happiness in every stitch. Machine sewing is WORK, IMHO. I’m pinning up a large CHristmas wall hanging (just did that), have just started pinning a king single quilt for a 3 year old grandson, will be doing todays instructions from the Fibre Art Traders group. When that’s done I hope to complete the Christmas quilt and make a good start on the bed quilt. The weather here is fabulous too, but I have a wall of windows next to my sewing table and a door which I keep open to the deck. I prefer machine sewing, as I’m always trying something I haven’t done before, even after about 13 years of quilting. I also really like hand sewing so will take some outside later (for the FAT piece) so that I can hear all the bird song and not just the machine. I’m outside now on the computer, bit of lunch, bit of email. I just finished a charm pack baby quilt top in Fig Tree’s Whimsy. Now to sandwich, quilt and bind it! I wish the weather was as lovely here as it it there. We’re supposed to have rain starting tonight into Monday! I still have to go grocery shopping for the next two weeks, including for Thanksgiving…..sigh. I have to admit, I’m a machiner all the way. But it’s mostly because I have 4 kids, 3 dogs, 6 cats, and a husband. I may be a stay at home mom, but I NEVER STOP. If I tried to hand sew something, it would never get done. I’m working on an English paper piece project. It’s a joke. It’ll never get done at this rate! But I appreciate handquilting. Some day…..someday. Gosh Amy where do you find the time for it all?